With the wedding and honeymoon back in February and my sister visiting from Korea this upcoming December, my husband and I didn’t have the vacation time (or funds) to do a big summer trip this year. Our Easter present from my parents was another caribbean cruise with them next spring, but it seems so far away! So, I decided that we needed some sort of getaway, even if it was just for the weekend. I had signed up for a Facebook Fit bootcamp in Austin which was supposed to be a day trip, and thought– why not extend my stay a little longer and bring Holden with me! So we’re driving down to Austin tomorrow and staying through Friday to explore the city together before heading to San Antonio for a visit with my in-laws. Notorious procrastinator that I am, I saved packing for the very last minute >.< Luckily, if there's one thing my parents taught me-- it's how to pack for a trip-- and lightly! (They recently took a 3 week trip to Europe and didn't have to check any bags!!) Here is what I'm taking with me on the road and a quick guide on what to pack for a weekend getaway. Do you have any fun trips planned this summer? 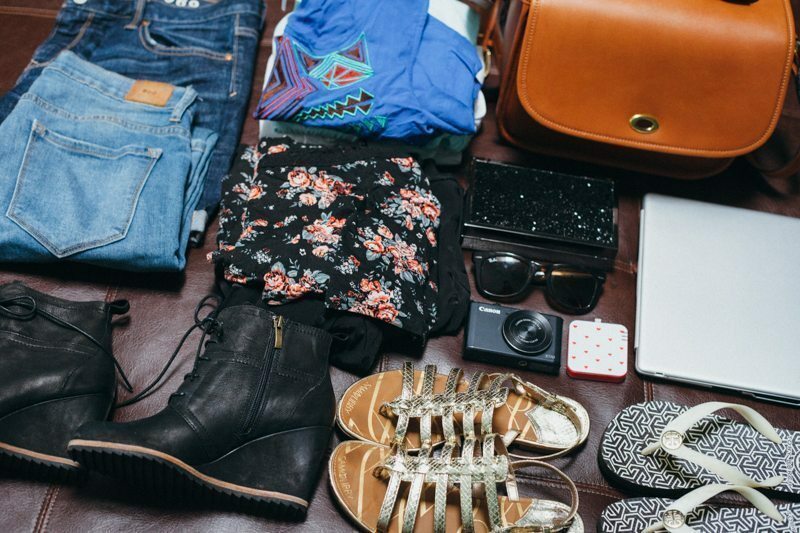 Share your packing tips in the comments! Linking up with Suitcases & Sippycups Travel Tips Tuesday! Love your suggestions! I’m a notorious over-packer and bring WAY too much when I travel! Have fun in Austin! Haha– I am definitely an over-packer by nature. Usually, I have to pack about two weeks in advance and spend that extra time whittling it down. Looks like a great collection of clothes for a great weekend trip! ^.^ I’ve been saving it for a special occasion!! Love it so much. Regardless of where we’re going or how long we’re staying, my wife packs as if we are moving–and won’t be able to buy anything we need after she seals the suitcase. It makes me not want to travel. Hope all went well in Austin and that you have fun in SA. LOL!! Us women just like to be prepared for anything! It always takes me the longest time to pack…..oh, the outfit choices! It’s the best and worst part! This past week, the trip to Hollywood for a press junket was my biggest wardrobe decision this summer. I’m so excited for you…….another cruise, but yes, seems so far off! Oh my goodness.. I don’t even know where to begin packing for a trip like yours!! You looked fabulous. Hope you had the best time!! Loved living vicariously through you. Reading this again…I love that first quote!